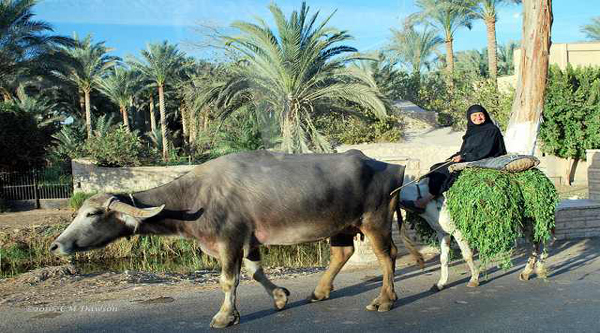 Egyptian woman in a countryside. Egyptian boys fishing in the Nile. Charity tables at Ramadan time. Although modern day Egyptians are usually lumped together with "the Arabs" due to their language and Islamic traditions, this is not completely accurate. 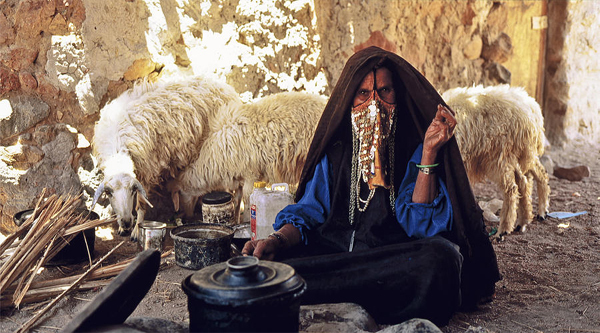 There is a truly Bedouins Arab grouping within Egypt, the majority still nomadic tribal peoples living in isolated oases and roaming through the country's vast desert regions. Many Bedouin Arabs are settled in the Sinai Peninsula and along the Red Sea coast, across from Arabia. However, anthropologically, the majority of indigenous Egyptians trace their ancestry back to the Semitic tribe of Ham. Their physical appearance and cultural traditions are distinct from all other Middle Eastern peoples. 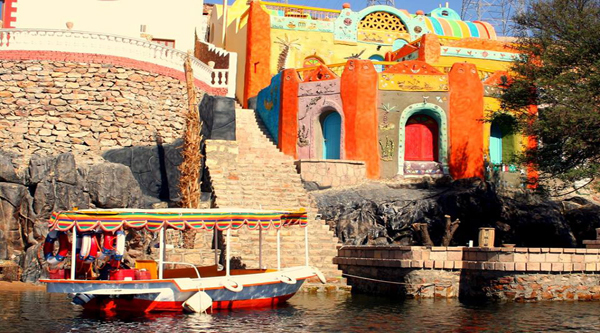 The third main racial grouping in Egypt is comprised of the Nubian People who lived for thousands of years in their own land along the Nile, called Nuba, which overlapped from Upper Egypt into northern Sudan. Most of Nubia was flooded in the time of Gamal Abdel Nasser with the construction of the Aswan High Dam and the creation of the artificial Lake Nasser. The government resettled the Nubians but much of their ancient culture stunning architectural tradition has been lost. For millennia wave upon wave of conquerors has passed through Egypt, leaving traces in their descendants. Romans, Greeks and, more recently the Turks, Caucasians (Mamluks) and even French and English have intermarried with the Egyptians, adding further to the cosmopolitan melting pot. For a half century the rural population has shifted to the main urban centers in search of employment. Until today nearly half the population reside in overcrowded cities. To remedy this, the Egyptian government has inaugurated a series of incentives to try and lure many Egyptians away from Cairo and Alexandria. Part of this program includes the construction of industrial cities located well outside the main centers and the program seems to be meeting with a measure of success. There are a number of other small distinct minorities including Berbers, most of whom live around Siwa oasis, and the 7 million Copts who share the same racial background as their indigenous Muslim countrymen but who were among those who remained wedded to their ancient Christian beliefs and traditions. Islam is constitutionally established as the official religion of Egypt and around 90% of the population is Sunni Muslim with a small minority of Bohra Muslims and other non-Sunni sects represented. Egypt is one of Islam's most influential intellectual centers. Al Azhar University, the oldest university in the world, graduates Islamic scholars from every Muslim country on earth. The Rector of Al Azhar occupies one of the most important hierarchical positions in the Muslim world and exercises great influence over religious issues of the day. Coptic Christians form the country's largest and most significant religious minority with government estimates claiming only 3 million Copts while Coptic Church estimates place the number at around 7 million. This disparity indicates an underlying tension between the dominant Muslim community and the Coptic minority, which has begun to flare up periodically in acts of vandalism with the rise of Muslim fundamentalism. Another one million or so Roman Catholics, Greek and Armenian Orthodox Christians as well as Protestants are also among Egypt's citizens. These groups, which thrived during colonial times, are now dwindling as a result of emigration. There is also a tiny and very discreet Jewish community, which has also been depleted by emigration. There are many churches open in the major urban centers but the lovely art nouveau synagogue in Cairo has been closed for decades.